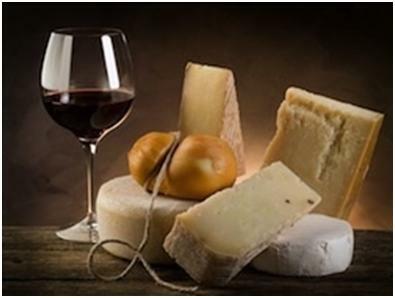 May 25th is National Wine Day, and National Cheese Day follows close behind (June 4), so in celebration of this perfect pairing of holidays, here are some tips for wine and cheese pairing. There are two ways to pair wine with cheese: pair like with like, or pair opposites. For example, acidic wine and acidic cheese share a common aspect and complement one another (e.g. sauvignon blanc and goat cheese), or an acidic wine may need a creamy cheese to balance it (like a peanut butter and jelly sandwich–the acid and the fat work together). If you’re looking for something to bring the fruit flavors out in a young, tannic red wine, consider a salty cheese. Liken it to the Mexican practice of sprinkling salt in a fruit bowl–the salt brings out the fruit flavors. How to taste: Take a sip of wine, then a bite of cheese, leave a little bit of cheese in your mouth, then take another sip of wine, letting the flavors meld together. Check out this useful Cheese Wheel at Match My Wine.